Psssssst! But, But, But, The Bike Is Just Sitting In my Computer Room! I was sitting there, messing around on the computer, when Pow! Psssst! and the front tire on my bike became flatter than a pancake! I had, just before the 30 mile ride yesterday, put a brand new tire and good tube on the wheel! 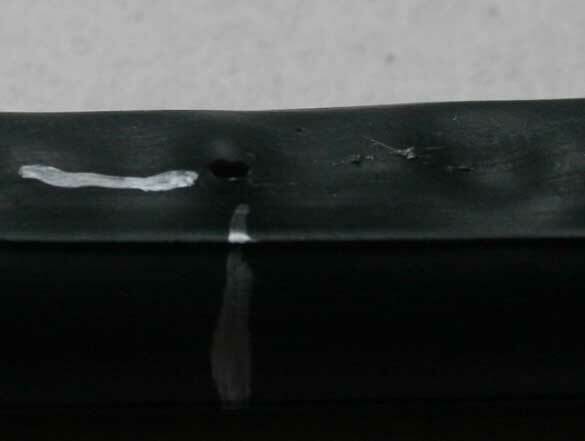 Now it was flat and it was clear that nice solid inner tube had a good sided hole in it! ...Remove The Tire and Look, silly! That is one big hole! the tire is just fine right there! Oh, the hole is on the inside! of the tube?? the rim tape is "out of sorts" and not covering the spoke holes in the rim. Part of the strip had gotten roll on top. The picture shows the rim side with the spoke hole clearly shown. The one on the left was the spoke hole that caused the tube hole. since the it was several years old and getting brittle (as I can tell now).